Coach Phil Clabaugh here at Eastern New Mexico University has been kind enough to let me join his team, and even go out of his way to give me presidence to his pitchers (which is definitely not due) at his teams workouts. 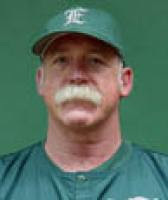 Coach Clay, as he is referred to around the athletic department, is the baseball coach, and has been for quite some time. His bio is incomplete on the schools slacking website (they still don't have Shorty as an assistant coach), so I can't get into his career coaching stats, but while walking through their clubhouse I found some old pictures up on the wall from the early 90's, (maybe even late 80's, my memory is weak with all this dry air) and he was at the helm then. He and the team has been quite welcoming to me, a non-alum, and let me mix in for bullpens, throw inter-squad to their hitters, and utilize their clubhouse whenever needed. In return I have been happy to work with some of his pitchers. He has about 17 or so on his staff, some with some real projectability (baseball term for could be a big leaguer some day). After doing pitching lessons all winter I know more what to look for, and have already helped with a couple guys, hopefully giving them an extra few K's, an extra couple mph's, or even drop the team era by 0.15, I'll take it, as long as they're getting better. I'm about to head out and meet up with the team again, and get my 20-30 pitches in off the mound to their hitters, working on my delivery, throwing strikes, and deceiving hitters. Honestly, I don't care if they hit me, as long as I'm hitting my spots and getting stronger and stronger right now. Careful, you might become the heir apparent. I just found the note about your release. Sorry to hear about it. Have you had any luck finding another spot?